Tareq was holding out his small fists in a triumphant manner, and Mhumhi dutifully sniffed each one. He could smell Tareq’s sweat; even though it was early morning the air was already shimmering with heat over the hills of garbage. “Let me try,” said Kutta, smiling up at him, nudging at Mhumhi. Mhumhi pushed her back. He trailed off, his skin prickling. It was very hard to pretend he wasn’t being watched- Hlolwa’s shuttered gaze was fixed on them from across the valley. He shifted his weight, licking his lips. Tareq’s smile faded too, and he drew his hands closer to his chest, looking over at her. “It’s this one!” cried Kutta, giving a little bound and touching one fist with her nose. Tareq stumbled backwards with surprise, his face creasing. “I dunno,” said Tareq, turning his shoulders away from all of them, as if to rid himself of that pervasive gaze. Kutta was glaring over at Hlolwa now, thought Mhumhi could not bring himself to do the same. It was just too uncomfortable; not only the sense that she was spying on something intimate, but the palpable feeling of her disgust. “Where’s Dot?” asked Tareq. He raised his fist- not the one Kutta had picked- and put the small piece of meat in his mouth. Mhumhi gave a little sigh. Tareq had learned the fox’s name alarmingly quickly, and it was hard to miss the longing looks he kept giving him. It was hard to explain that Bii was not the sort of dog that would want to be petted. “Then let’s drink some water,” Kutta persisted. “It’s hot now, aren’t you thirsty?” She gently mouthed his hand and pulled it towards the little plastic bottle Sekayi had filled for them earlier. Tareq picked it up, gazing at the small flecks of detritus floating around in the bottle’s transparent interior, and then took a sloppy drink. “I’m not,” Mhumhi insisted, though his haunches were sinking. Of course he was frightened of her. How could he not be? Mhumhi raised his lip and tried not to slink as he crossed the valley. He had a realistic idea of how well Hlolwa would take a command, and he would be no good for enforcing it, and just end up looking like a fool. A long time ago he could remember not minding at all when he looked like a fool, but he had had his sisters and mother to protect him then. He tried to keep his tail up as he approached Hlolwa, but the effect was certainly mitigated by his indirect gaze. Nearby, Kulwe snored on his pillow, his wounded leg stinking in the heat. Perhaps he ought to be moved out of the direct sunlight- but Mhumhi certainly wasn’t going to expend the effort. Hlolwa had not so much as blinked upon his approach, lying still with her forepaws stretched straight out like a regal statue. The sunlight highlighted the thin skin around her notched ear in pale red. When Mhumhi opened his mouth to speak, she cut him off. Mhumhi looked at the small bowl Sekayi had left them, and indeed, it was dry. He also saw how the dirt was scuffed all around it; it was barely within straining range for her. Behind her she had made an effort to constrain her toilet to one small area, but it still stank, and doubtless felt too close, at just a chain’s length away. Her companion had let his runny feces stain the pillow he was lying on. “You’ll get more when the others return.” He flinched a little as she turned her head towards him. The area around her neck where the chain sat looked raw. “Then why have you come over?” asked Hlolwa, as if his only purpose would be to take orders from her. His forelegs tensed. Predictably, she laughed at him. Kulwe raised his head at the noise. “Yes,” said Mhumhi, nearly growling. She showed him her molars. “Not you,” growled Mhumhi. She whuffed with laughter. Mhumhi shifted his weight and glanced away. He bristled at the dismissal, but as usual he couldn’t think of a good response. He began to retreat back around the fire pit and nearly ran into Tareq. Tareq was walking towards the painted dogs, frowning, water bottle still swinging from one hand. Kutta trotted around his other side. “Yes, they are,” said Mhumhi, glad for the petty feeling of satisfaction the words gave him. Hlolwa slowly closed her eyes. Mhumhi was a little stunned by the statement, but Kutta came close and pressed her side against Tareq’s legs. “If we have to. If they try to hurt you, we will.” She passed a look to Mhumhi. He felt slightly wounded. Tareq twisted his lips, his brow furrowing. “Yes, they are, so they can’t get you,” said Kutta. Tareq shook the water bottle again, frowning. Mhumhi saw her eyes snap open and was between her and Tareq in the next second, but all she did was rise to her feet and show her teeth. “Don’t let it address her again,” spat Kulwe, cycling his forepaws on his cushion, strangely reminiscent of Mini. Tareq gave a prolonged sniff. “Maha said they get mad when you talk to them. An’ she was right. They got mad and bit me n’ Dot n’ they bit her too…” His words became garbled, and his small shoulders shook with another sob. Mhumhi turned around and licked his salty tears and snot off his face. Tareq put one hand on the ground and wiped his face with the back of his other one. Mhumhi glanced at Hlolwa, but her expression was entirely inscrutable. Kutta gave him a startled look, but Tareq shook his head. “It would have been okay to pee then,” Kutta reassured him, though she was still looking strangely at Mhumhi. “No,” said Tareq, scowling through his tears. Mhumhi wasn’t sure if it was about the peeing or something else. “It was foolish of them,” said Hlolwa. She had begun to lie down again, positioning her haunches sideways so that she could lean to one side. Hlolwa drew her lips back slightly. “That’s not what you do in the city,” said Kutta. “In the city it is best to have one’s meat where it is easily accessible,” said Hlolwa, and lowered her head to lick one forepaw. Hlolwa turned her head slowly to address her. For a moment Hlolwa stayed completely still, and Mhumhi felt a touch of satisfaction. Then she rose to her feet. Her chain jangled. He could not resist the urge to step back. “Does he look like a monster to you?” Mhumhi demanded, jerking his head towards Tareq. “It’s not our voice,” said Mhumhi. “Devils?” Mhumhi had not heard the term before. She was wrong. 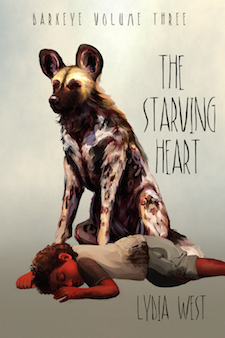 Mhumhi had turned his nose away, for he was thinking of Lamya, who had gleefully predicted the dogs starving to death, killing one another; he thought of Mini’s man, who had tried to destroy a building full of painted dogs. “But they are like us,” said Kutta. “Certainly that is true for you,” said Hlolwa. Mhumhi looked at Tareq. He was still sitting on the ground, one finger in his mouth, drawing swirls in the dirt with another. “Before you leave, I have one more question,” said Hlolwa. Hlolwa laughed, a low sound. She flicked her eyes up at him, mocking. She knew how feeble his threats were. Hlolwa lowered her gaze, almost demurely. Mhumhi felt his skin prickling. Kulwe was staring over at them, hard. “Madame,” said Kulwe, almost nervously.